Chafing is a skin condition that occurs when the skin gets irritated and dry through constant rubbing of the skin against any material, clothing or one’s own skin while walking, exercising or running. The constant friction, which results in red sore patches, often causes the skin to peel and even bleed. Environmental conditions and excessive dryness of your skin can also cause chafing. The most affected area for chafing includes underarms, inner thighs, groin or upper arms. 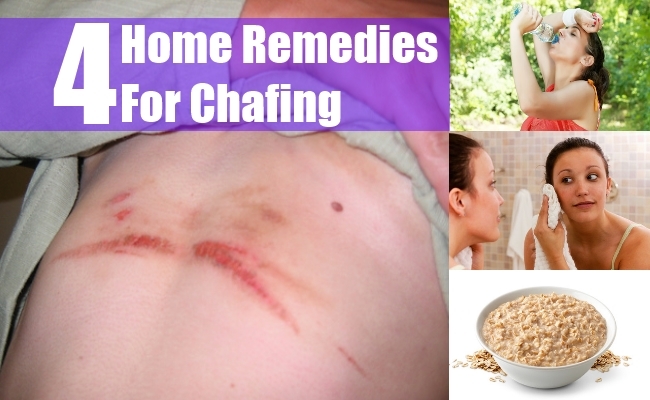 Chafing is a painful and uncomfortable experience that makes everyday activities painful. Ignoring chafing can lead to skin infection, particularly in people with suppressed immune system. While there are many ointments and creams available in the market to treat chafed skin, it is also possible to heal chafed skin using a variety of natural products available in our homes. Some people suffer from chafing due to excessive fluid loss like excessive sweating or running a temperature for a long period, or experiencing diarrhea. If you are experiencing fluid loss for any reason, rehydrate your body by drinking lots of water and fluids. This will help to restore moisture in your skin by minimizing dryness. Along with hydrating your body, you must also restore the balance of your body using supplements containing specific nutrients like vitamin C and A, especially when you are prone to chafing. Vitamin A and C can heal the chafed skin by enhancing the moisture content of the skin and help get rid of pain. Many people experience chafing when their body parts become moist due to sweating, particularly during hot summer months. Perspiration increases pain and irritation. So you must keep the affected area clean to heal the skin and avoid any kind of infection. To keep the skin clean and free of bacterial or fungal infection, wash the affected area using disinfectant soap and water. Try to keep your body as dry as you can by wearing pure breathable cotton clothes. Use talcum powder on the inner thighs and anywhere else you experience chafing to reduce friction. You can also wrap an elastic bandage on your thighs and legs while playing sports to reduce friction. Overweight people may also use elastic bandage during activities to prevent chafing. Fill your bathtub with lukewarm water. Do not use hot water as hot water will cause irritation and dry out your skin further. Take a handful of oatmeal and drop it in the water and wait for few minutes to let the oatmeal set; then lie in the tub for at least 15-20 minutes until the oatmeal binds to your skin and soothes the chafed skin. Wash the infected area with gentle antibacterial soap and water. Pour few drops of olive oil in a dish. With the help of a cotton ball, apply olive oil on the affected area. To allow olive oil to seep into the chafed skin and deliver moisture, place a bandage over it. Your skin will heal fast. You can also use any of these lubricants to get relief from chaffed skin like petroleum jelly, almond oil, vitamin E cream, Aloe Vera gel or baby oil.